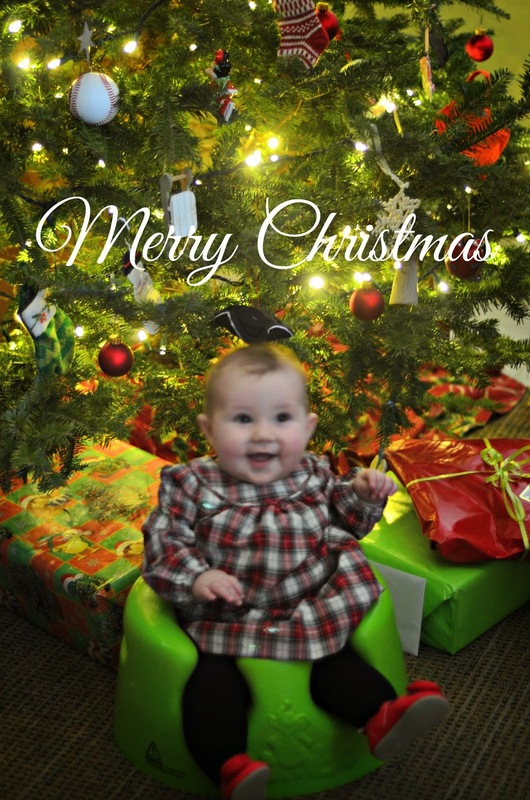 Just stopping by to wish you a very Merry Christmas! I'll be spending some time away from the blog to celebrate Christmas and spend time with my family over the coming week. And don't forget to enter the $25 Target gift card giveaway! Last week, the mister and I went on a somewhat last minute shopping trip to buy gifts for our extended family (they had to be mailed since they live out of state so we were in fact getting down to the wire). Today is the eve of Christmas Eve (as my mom always called it), so we're really getting down to the wire with getting gifts, aren't we?! One of my favorite places to shop is Target. They have a great variety of last minute gift ideas for everyone on your shopping list! I'm honestly still not done with all my Christmas shopping this year, so I'll likely be heading to Target myself. While shopping, these nickel-free stud earrings caught my eye. They would make a perfect gift for a girlfriend or sister. I also saw them in gold in the store. These wool blend socks are perfect for my mother-in-law. They offer lots of warmth from the wool blend without being bulky in a boot and even come in a variety of patterns and colors. The moccasin slipper would be perfect for my brother, with its simple silhouette and fuzzy lining. And who doesn't love a Target gift card as a present? I received one for my birthday a few months ago and it was perfect; I could pick out a few things I'd had my eye on in the store. Did you know Target gift cards are available to give via email or text message? I'm pretty sure that makes them the perfect last minute gift...you don't even have to go to the store to purchase them! Share your favorite last minute gift idea in the comments section below and you'll be entered to win a $25 Target gift card (and leave your email address so I can contact you). 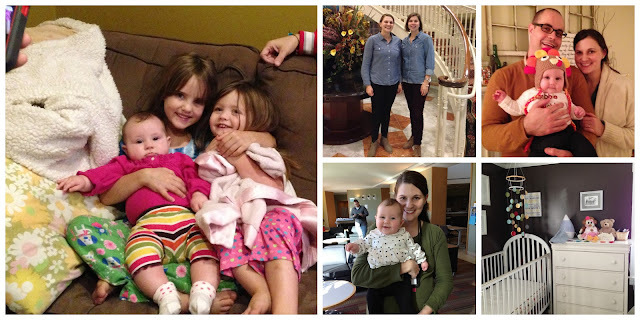 As a parent, I have more of a desire to establish family traditions. I find myself wanting to be intentional about the ways we celebrate birthdays and holidays and Christmas is no exception. 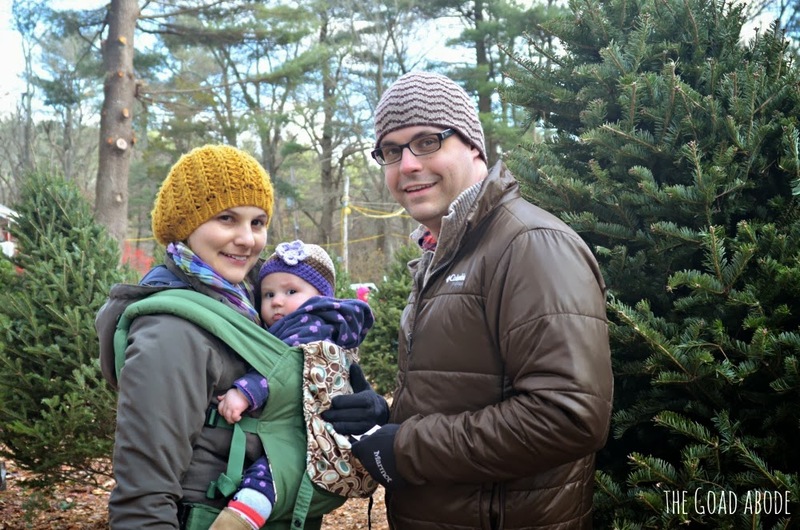 As our daughter grows up, I'm caught between wanting carry on some of the memorable traditions I grew up with and make our own family traditions. We haven't done too much to create traditions with Maggie, but I hope to cultivate more as she grows up. This year we have a live tree decorated with white lights and a collection of ornaments. 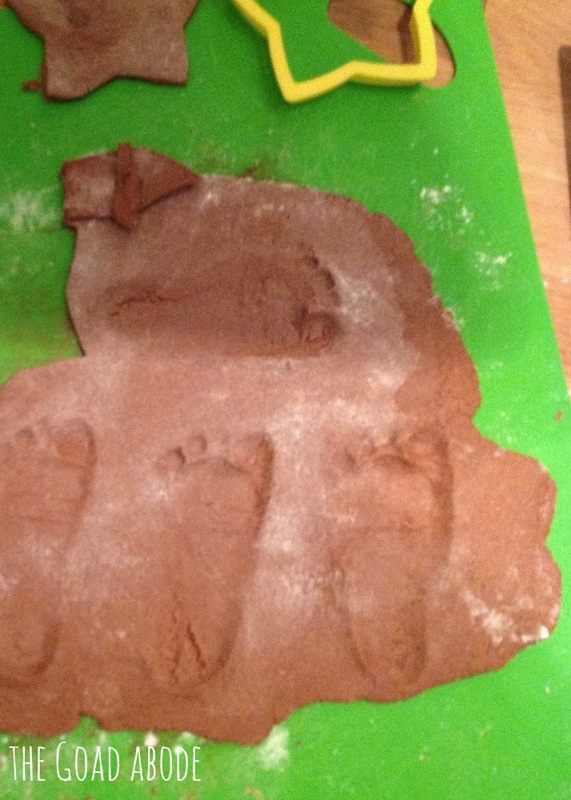 I wanted to get an ornament for Maggie that wasn't the usual "baby's first Christmas," so I made an cinnamon dough I found via Pinterest to make an ornament with an imprint of her foot on it (they smell amazing and dried in about 30 hours). I look forward to teaching our girl about the importance of giving in this season, whether it's buying gifts for others or volunteering our time and energy or baking/cooking to give the goodies away. I usually try to keep this blog light and fun. And from time to time, I share the weightier matters of life. But lately I am not sure what to write. My heart is full and so is my brain. We've had our share of "curve balls" thrown at us lately. Life doesn't go "as planned" ...whatever that means. When I stop and think about those plans and what I was expecting, I realize most of them fall into the "first world problems" category. No matter how disappointed I may feel about things not working out, I still have a healthy family, a warm home and a good job. And to top it off, I have so many things, from too many clothes (despite efforts to purge my closet numerous times over the past year) to a kitchen full of gadgets to a warm vehicle at the start of what seems to be a rough winter. Keeping that in mind, I cannot even begin to complain about the seemingly hard things. Recently, a friend asked me how things are going and I told her it was a loaded question then proceeded to rattle off a series of apparent setbacks. She was so gracious to listen and gentle to respond, "sometimes you just need to cling to Jesus." Touché. Christmas is one week away. Where is my heart? What am I spending my energy on? I want to be clinging to Jesus. To come and worship the newborn King. To be in wonder of how God sent his only Son to earth in the form of a newborn. 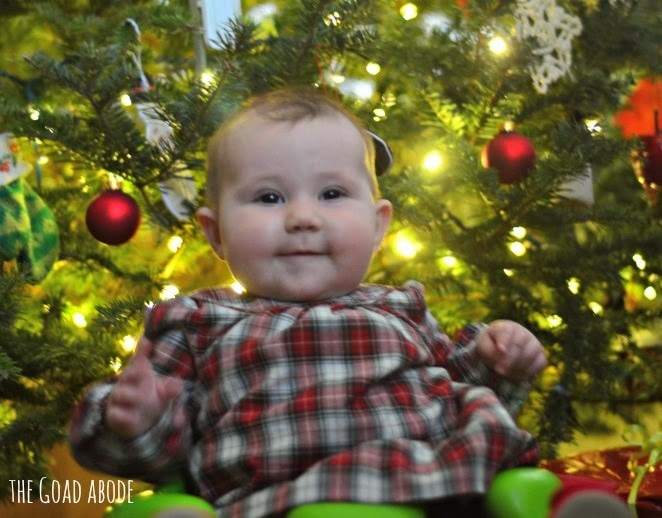 A newborn is something I have a new view of this Christmas, having had my first in July. I am in awe. I've been entrusted with a new life. It is the biggest responsibility I've ever had. I may not be making the time to blog as regularly as I once was, but I am soaking up each and every moment, every squeal, every diaper blowout and even the sleepless hours. And all the while, I want to be clinging to Jesus, depending on His strength when I go to work after a night of three hour's sleep. 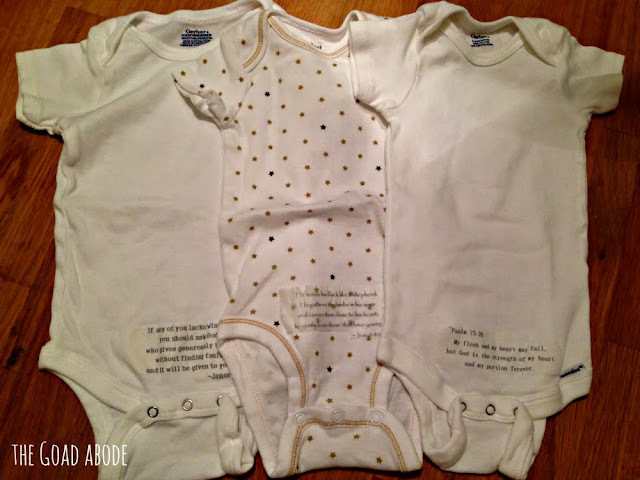 A thoughtful friend gave me a set of three onesies with a verse on each. I love her wisdom. 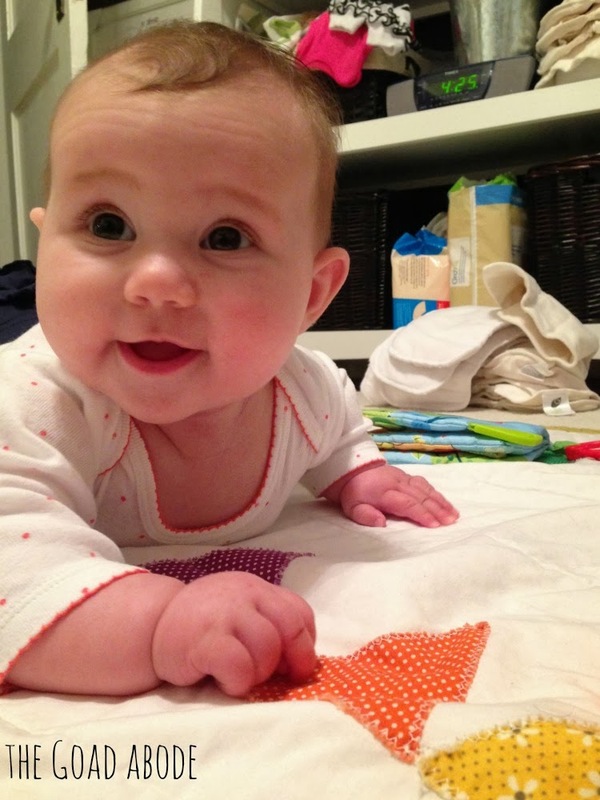 It's a reminder that even the "small things" matter (Zechariah 4:10); even changing diapers should be a reason to rejoice. What are you clinging to when things don't go as planned? Last weekend, we picked out our Christmas tree. The annual outing is one of my favorite days of the year. This year, it was fun to take Maggie on her first Christmas outing, listening to Christmas music as we drove. We've gone to various places to get the tree depending on time and budget for the year. 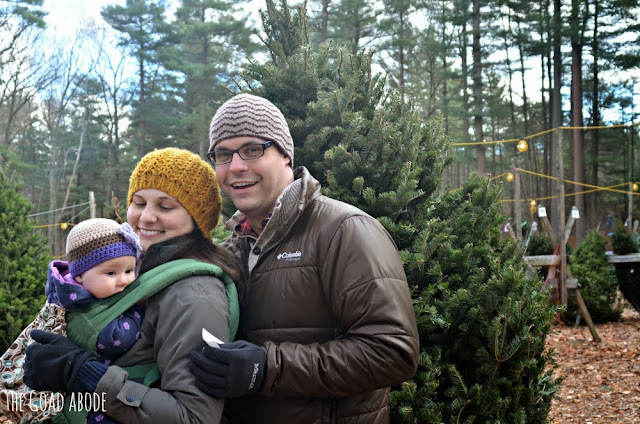 This year we went back to a local Christmas tree farm where we bought our first tree as a married couple. They have hot cocoa and mini cider donuts-- yum! 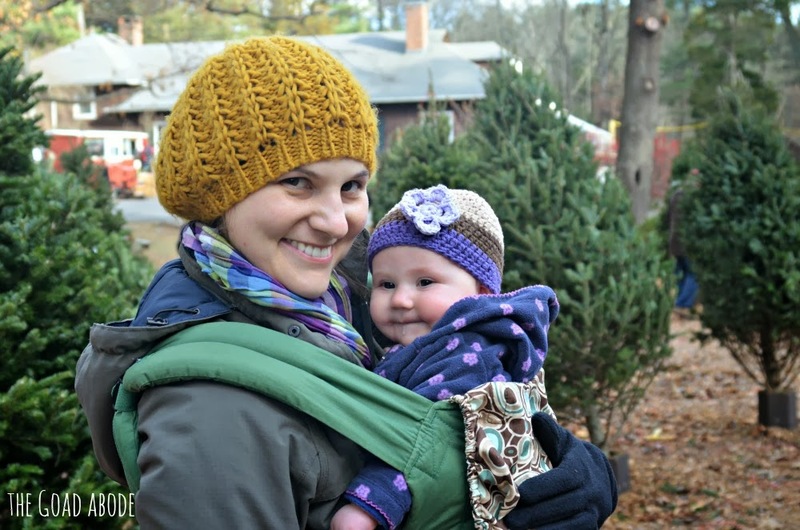 Maggie's hat was made by Christa who has a beautiful handmade shop, Ora Dale. A good friend and colleague and I dressed alike! 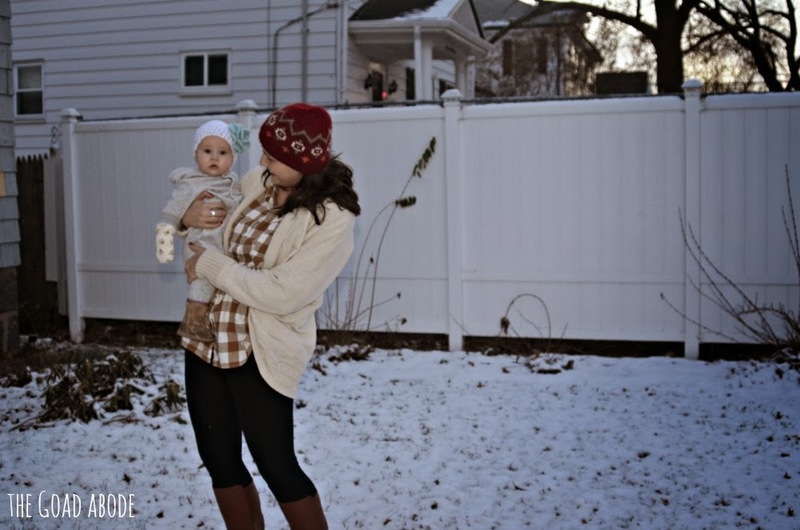 We had different accessories on, but took them off for the photo below (chambray, dark pants and taupe booties). Our first Thanksgiving as a family of three. Maggie's nursery is finally finished (this has been a goals for the past few months). Take time to read each Advent scripture as a family. Read. I've started a few books recently and I'd really like to finish them (I'm thinking it may have to wait until later in the month, but I do have some time off after Christmas). Make at least three Christmas gifts. 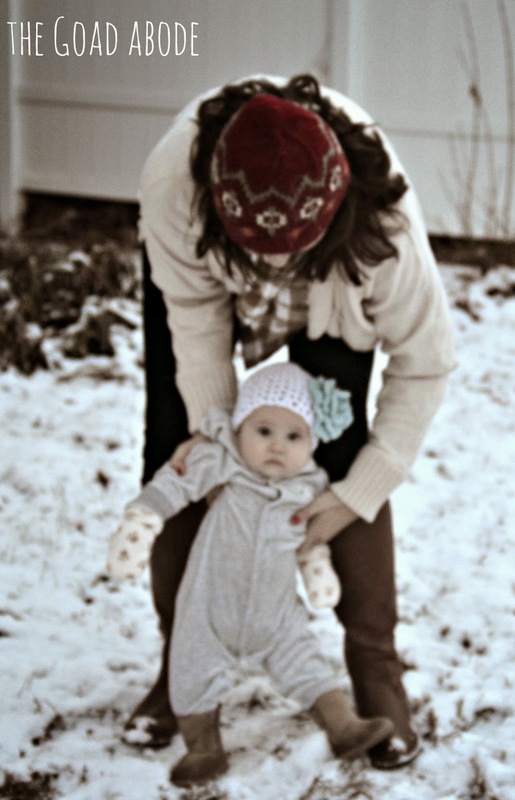 Introduce Maggie to snow (weather dependent, but I hope it happens this month). We're using this printable Advent calendar this year. I've always preferred Coke to Pepsi, but Coca-Cola is doing things right. I love honesty and Brooke's post about Pinterest hairstyles was spot on (at least for me)! Looking for a way to give this month? Lauren has practical tips for how to make a difference to a women's shelter. I'm thinking about making this Christmas tree ornament for our family. It's your turn to share your list! On the first Friday of the month Erika and I share our favorite things from the past month and what we're looking forward to in the new month. 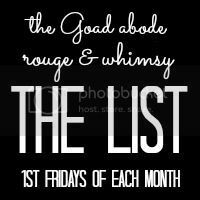 It doesn't have to be fancy, it doesn't have to be long, it can just be what the link-up is: a list. 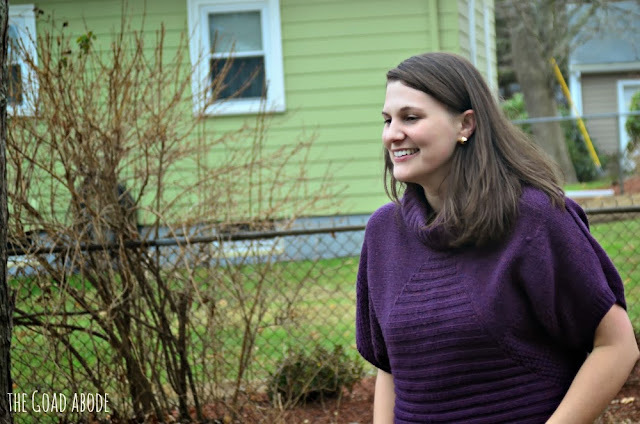 Grab a button + link up your post below and be sure to check out others' lists! Life has been moving along faster than I can keep up most days and I haven't taken the time to pause and reflect on this new world of motherhood much. In some ways, I think that makes life easier; the just keep going mentality certainly works in a lot of situations for me, so why should motherhood be different? However, I also want to stop and smell the roses (so to speak) because life moves fast and there are some many things I don't want to forget about this season. 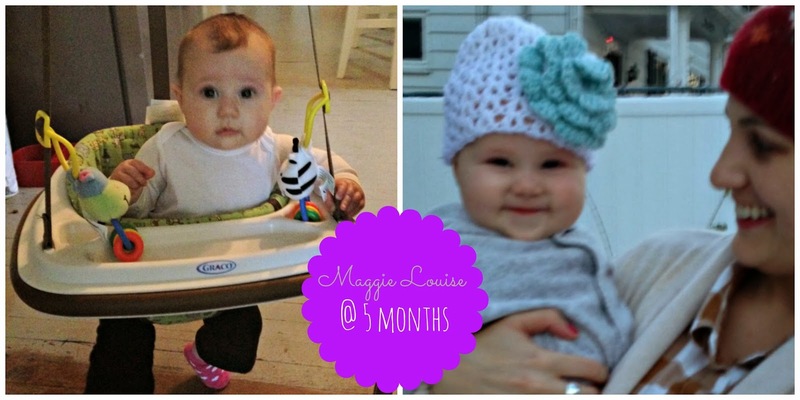 When Maggie was just a few weeks old, I reflected on this new season, calling it the sweetest valley. 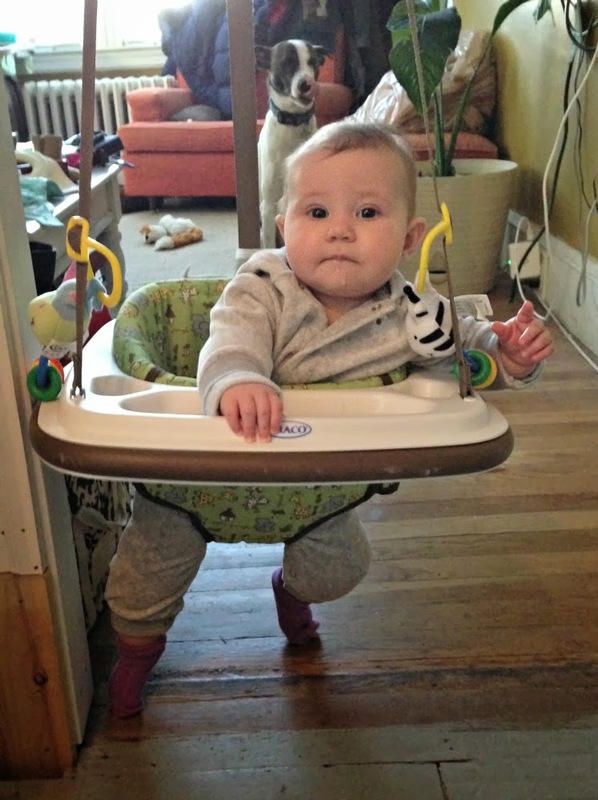 As much of a "good baby" (doesn't fuss a lot, is easy to calm down) as she often is, we've also had our share of tough moments. These moments make me feel I'm still in the valley; the terrain feels rocky and I can't see far ahead. I have to remind myself the valley is where life is lived. Even though Pinterest tempts me to think life is about mountain top moments with beautiful views and an immaculate home (note the pile of clean diaper inserts just having out on the floor behind my girl), I know life is more about digging in and embracing each moment be it ordinary or even seemingly insignificant. I've been meaning to get some outfit photos for a while. I'm no fashion blogger, but I've been thinking a lot about my closet and the clothes I wear over the past few months. Becoming a mom, has forced me to look at the clothes I wear a bit differently. I'm always considering how my clothes will feel against my baby's skin, how easy/challenging they will be to nurse in and if they will distract a bit from my sleep deprived face (more on that later). This past weekend there was a rare moment: the babe was sleeping, my husband was home and I was dressed in clothes I'd actually want to be photographed in (rather than sweats), so I grabbed the camera and asked my man to snap some photos. When I stepped outside, our neighbor was on his back porch and was quick to ask about the little one. Unknown to me, the mister went to work taking some pics.